The demise of the Socialist bloc in 1989 has engendered structural changes in the economies and planning practices of Cuba and other continuing socialist countries such as China and Vietnam. Indeed, in the 1990s the Cuban government was obliged to promote a series of economic and institutional reforms (reviewed in Colantonio and Potter, 2006) that opened up the economy and identified international tourism and the external sector as the pivots of a new development strategy. For…Cuba, continuing communism in the post-Soviet era required readjustment from semi-colonial client state status (in relation to the Soviet Union) to an independent status exposed to the rigours of the (capitalist) global economy, of which international tourism is clearly an integral element. As a result of the mix of tourism promotion strategies and opening up of the economy, Cuba experienced a rapid increase in tourist arrivals, which leaped from 340,300 in 1990 to 2,300,000 in 2005, and has become a major recipient of foreign direct investment (FDI) in the tourism industry since 1989. Several new hotels have been built or refurbished through joint ventures, while others have been built by the Cuban government and contracted out through management agreements with foreign firms. The aims of this paper are twofold. The first is to review how fundamental principles and practices underpinning Cuban socialist planning mechanisms have changed since 1989 as a result of the economic opening up. It is worth pointing out that the focus of the paper is on applied practices rather than theoretical considerations concerning the positive and negative aspects of centralized planning. The paper argues that the influx of FDI has prompted de facto a change in economic and physical planning in Cuba. As a result, old planning practices are becoming increasingly incompatible with new tourism project procedures and are in general need of thorough modernising. The second aim is to assess the risks, opportunities and peculiarities of tourism planning in Cuba that are linked to the nature of the country’s political system and the operational model of international joint ventures set up between Cuban and foreign firms. The paper is composed of four sections. The first reviews the increase of FDI in tourism in Cuba, with special emphasis on the main costs and benefits associated with the variety of FDI agreements, ranging from total private ownership of the project by the foreign investors to total public ownership by the host governments. The second part examines the changes in planning practices that occurred in Cuba in the 1990s, including the shift from medium- and long-term plans to short-term ones and the increasing ineffectiveness of both the macro-localization process and fines imposed in pesos to those who breach planning regulations. The third part studies the main risk and opportunities associated with the newly-established planning practices, while the last section will draw some conclusions concerning tourism development planning in Cuba from 1989 onwards. Globalization and neo-liberal policies, including liberalization and privatization, have generated a significant growth of FDI in recent years. FDI is considered an important source of private capital and foreign currency which is capable of spurring economic growth in developing countries (Te Velde and Morrisey, 2002). FDI in developing countries has increased from US$ 24 billions (24 per cent of total foreign investment) in 1990 to US$ 178 billions (61 per cent of total foreign investment) in 2000 (World Bank, 2001). Although Colantonio and Potter (2006) have pointed out the potentially negative political and social implications of FDI, this form of investment has often been associated with the formation of productive clusters that facilitate the transfer of technology and human capital, as well as helping domestic producers to develop (UNCTAD, 2001). States from the South have encouraged cluster-driven development strategies to enhance domestic capacity building and, to a lesser extent, to defend domestic markets. Cluster-based economic development aims to achieve high-performing regions through building the valuechain, which encompasses key foundation elements, supplier industries, and final export, within each cluster of a given region. Cluster studies focussing on the successful expansion of tourism in developing countries have highlighted the fundamental importance of heavy investment in tourism infrastructures, which range from transport systems to accommodation. Seldom do governments from the South have access to public funding from international agencies to finance such infrastructural upgrading without a significant string of economic structural adjustments being attached to the lending. Therefore, the governments of developing countries have increasingly sought FDI as a source of private funds for investment, especially in the accommodation sector where large capital is required to develop major projects. FDI can take a variety of forms and shapes when establishing linkages with national economies. 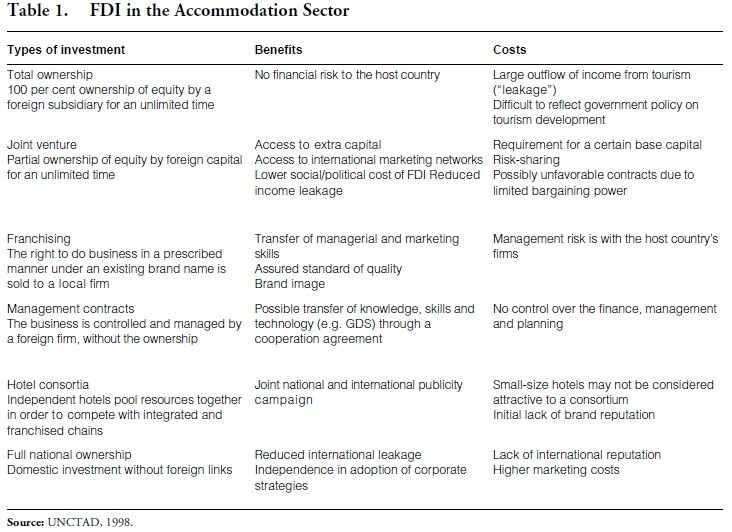 These are summarized in Table 1 in relation to the accommodation sector. The table also provides a review of the main costs and benefits associated with the FDI agreements, ranging from total private ownership of the project by the foreign investor to total public ownership by the host government. It shows how the encouragement of specific types of FDI can be functional to the achievement of state national development goals and closely linked to the ideological and political beliefs of national governments. For example, full national ownership will be pursued by governments which aim to retain control in tourism decision- making. By contrast, governments that are not willing to take the financial risk of tourism development strategies encourage full private ownership. In the specific case of Cuba, it proves difficult to establish the economic importance and the nature of FDI agreements due to restricted access to official data. Publicly available figures of foreign capital inflows are limited to the number of International Economic Associations (Asociaciones Económicas con Capital Extranjero, AECEs) by year, by sector, and by country. These include both joint ventures and International Economic Association Contracts, where the contracting parties do not set up a separate legal entity. 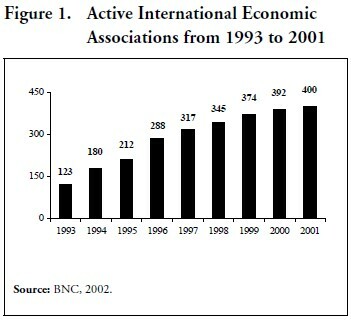 Figure 1 shows how these associations increased threefold from 129 in 1993 to 400 in 2001, recording a 23 per cent average annual growth rate. Although this data precludes an in-depth analysis of the strategic nature of AECEs, it provides hints as to the magnitude of the penetration of foreign capital in today’s Cuba. In this context, Spadoni (2002) quotes figures by the Cuban Central Bank according to which, between 1993 and 2001, FDI in Cuba amounted to some US$ 1,964 million. International Economic Associations are not the only type of foreign investments currently allowed in Cuba, as two other forms of economic agreements are permitted between Cuban and foreign firms. These are management contracts and production contracts. Management contracts are reached when a Cuban firm contracts a foreign entity to manage their infrastructure or business for a stipulated period of time and with a remuneration based on the results of the activity agreed upon. Production contracts are agreements according to which the foreign party supplies finances, material resources, and technology to their Cuban counterpart in exchange for the production of goods by the Cuban firm at a set price for the domestic or international markets. Most of these other forms of direct and mixed investments and new management contracts can be found in the tourism sector. Official statistics report that at the end of 2000, there existed 29 joint ventures in tourism, with a total capital of US$ 1,089 million, 26 of which were hotel chains managing 15,600 rooms. Of these, 3,700 rooms (about 10 per cent of the total) were already operating, while the remainder were in the design or construction phase (MINTUR, 2001). In the same year, 17 international hotel chains were reported to have management and marketing contracts with Cuban counterparts, for a total of 54 hotels and about 16,120 rooms under management. These contracts had a validity of five to seven years but could be prolonged if the partners agreed. A large share of the joint ventures and management contracts in the accommodation sector are with Spanish (Sol Meliá, Grupo Riú, Iberostar), French (Accor and Club Med), German (LTI), Italian (Ventatur), British (Qualton), Canadian (Life Hotel), and Dutch (Golden Tulip) companies. It was estimated that joint ventures will account for 20 per cent of total room capacity by 2005 (Figueras, 2003). The advantages stemming from an affiliation with large hotel chains are multiple, as described earlier. ECLAC (2000) highlights two such advantages for chains in the Cuban case. Firstly, large hotel chains, such as Sol Meliá, can facilitate many forms of access, encompassing: (i) financing; (ii) advertising and marketing programs and distribution and reservation networks of the foreign chain; (iii) suppliers and purchaser groups; and (iv) transfer of a wide range of technologies and the use of an internationally recognized brand image. Secondly, foreign partners normally appoint the Managing Director, the auditor, and a limited number of personnel in each establishment. These individuals, in turn, divulge the mother branch’s operating manuals and facilitate the transfer of know-how, especially concerning principles of market management. Planning has been a milestone of Cuban socialism and it has been taken seriously by the Cuban leadership since the triumph of the revolution. In 1962, the National Institute of Physical Planning (Instituto de Planificación Física, IPF, originally created in 1955 and called the National Council of Physical Planning) was set up. Since 1994, the IPF has been part of the Ministry of Economy and Planning as the leading state agency regarding territorial planning. The Institute is responsible for accomplishing, directing, and controlling the policy devised by the government concerning the use of land, the spatial organization of socio-economic activities, and the management of human settlements (IPF, 1998). The IPF is at the top of a hierarchical system of institutional structures that consists of Provincial Offices of Physical Planning (Dirección Provincial de Planificación Física, DPPF) and Departments of Architecture and Urbanism (Departamentos de Arquitectura y Urbanismo, DAUs) in the 14 provinces and 169 municipal offices of the country. These offices exercise control over construction, information gathering, and statistics. Furthermore, their goal is to adjust centrally-taken decisions to meet local conditions. Both DPPFs and DAUs are technically subordinated to the IPF, but functionally and administratively they depend on local government. They epitomize the Cuban government’s recent efforts to decentralize the decision-making process at the local level. However, informal discussions with various members of Havana’s Office of Physical Planning have highlighted how such efforts have yielded mixed results. For example, it is argued that the power of IPF municipal offices is limited to the gathering of statistical data, while the provincial offices have often had a mere consultative function. 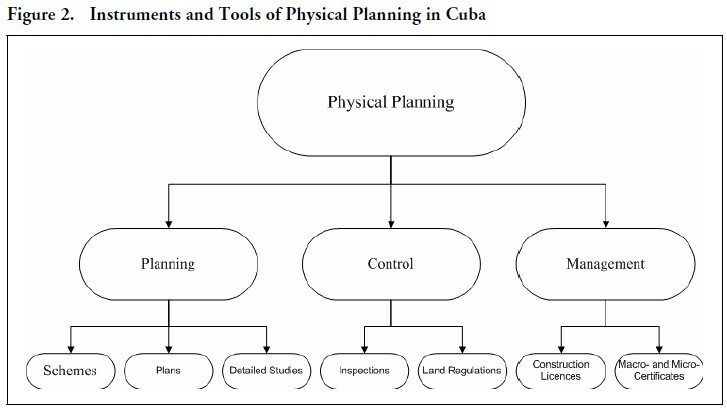 The main instruments used by the IPF for physical planning in Cuba are summarized in Figure 2, which points out how each dimension of physical planning relies on the use of specific tools and mechanisms. These are: schemes, plans and detailed studies that are the basis of planning; inspections and land regulations upon which the control sphere of planning relies; and construction permits and macro- and microcertificates that constitute the management dimension of planning. The review of all these instruments and tools is outside the scope of this paper, and only the significance of schemes, plans and macro- and micro-certificates will be reviewed here. Schemes and plans for territorial development exist at the national, provincial, and municipal levels. Schemes can be short, medium, and long term-oriented while plans are of two kinds: general or partial. The main difference between the two instruments lies in their functional applications. While schemes have a mainly strategic planning function, plans are more oriented towards achieving tactic-operational goals. Macro- and micro-certificates are also of crucial importance within the planning process. In recent years they have both been required by the Ministry of Science, Technology and Environment (CITMA, Ministerio de Ciencia, Tecnología y Medio Ambiente) to grant environmental licenses and authorization to begin construction work for new or refurbished economic activities. Baroni (1991) notes that macro- and micro-certificates are the first legal requirements to be met by investment proposals. 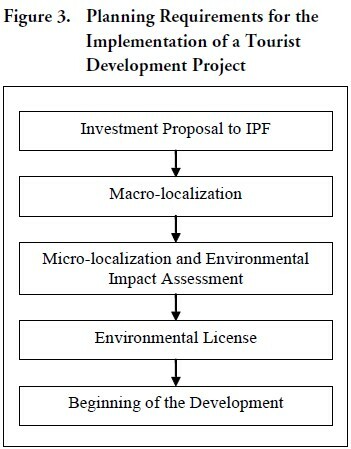 Indeed, national and foreign investors are required to present their investment project to IPF which, subsequently, identifies the national area most suitable to receive the new investment (macro-localization or macrolocalización). Once the macro-localization has been agreed, the investor has to consult the Provincial Offices of Physical Planning to obtain the micro-localization (microlocalización) for the investment proposal, that is, the specific location of the project. • A shift from medium- and long-term plans to short-term ones. • The macro-localization process is increasingly being ignored by investors. • Fines in pesos against illegal constructions and activities are ever less effective because of the increase in purchasing power of dollar and convertible pesos-earners. Firstly, planners of the IPF have highlighted how the scarcity of financial resources determined by the economic crisis of the 1990s has increased uncertainty which, in turn, impedes the establishment of medium- and long-term development plans. As a consequence, development strategies and plans are increasingly short-term in their orientation. Secondly, in the late 1990s there emerged a tendency on the part of national and joint-venture investors to approach DPPFs directly with specific investment proposals that skipped the macro-localization process. González (2001), for example, reports how a Canadian group approached directly Havana’s DFFP for a micro-localization permit to open a bank and a shopping centre in a disused green area just off the corner of 23rd Avenue and L Street. The investment proposal was initially taken into consideration but subsequently rejected. Despite the negative outcome, this instance highlights that foreign investors’ market- driven choices are becoming ever more incompatible with the macro-localization plans of Cuban planners. Lastly, fines against private illegal or unauthorized constructions are generally levied in pesos, and their effectiveness has been undermined by the introduction of the convertible peso and the dollar (until 2005). Peso fines can easily be paid by newly-enriched private small entrepreneurs who earn in hard currency. This, in turn, is transforming fines into an ineffective planning control instrument. According to a planner based at Havana’s DPPF, the average fine for unauthorized extension of a private house is 1,500 pesos (roughly US$ 58). While such a fine could deter a peso-earning worker from ignoring the construction permission process, it is clearly not sufficient to dissuade convertible pesos earners. The economic reforms and the planning adjustments introduced in the 1990s have been characterized by the appearance of an environmental component in the planning realm. Investment proposals by national and foreign investors have to comply with procedures and requirements unknown before 1989. The most innovative planning change is perhaps the integration of macro- and micro- localization certificates with an Environmental Impact Assessment (EIA) to obtain the required Environmental License issued by CITMA (see Colantonio and Potter 2006 for an indepth review of environmental reforms in Cuba during the 1990s). Figure 3 summarizes the three main elements that are required by CITMA to issue an Environmental License for the development of a tourism-oriented project in urban and rural areas. It can be seen how the EIA, along with macro- and micro-certificates, have become a pre-requisite to begin any construction work, especially in the tourism sector as it has been deemed responsible for much of the new wave of environmental disruption in Cuba. Indeed, the investor has to present an EIA of the proposed development plan to the local DPPF along with a list of measures to be adopted to mitigate or prevent negative impacts that may stem from the project itself. Finally, CITMA reviews the documents and eventually decides whether or not to concede the environmental license. The new planning mechanism represents, at least in theory, a step forward towards more environmental concern in Cuba. However, its translation into practice has not been exempt from criticisms. Officials dealing with environmental issues have highlighted that the majority of the investors are more concerned with the technical and economic details of the construction plan (architectural style and economic budgets of hotels, for example) than with its EIA since they do not consider it a priority. In practice, the EIA is conducted only after other expensive and timeconsuming legislative requirements are met by the investor to obtain macro- and micro-localization permits. Thus, CITMA personnel often receive project proposals that have negative implications for the environment and have to face the dilemma of whether to grant the Environmental License or not. The denial of the Environmental License means that the whole micro-localization process has to be carried out anew in order to generate less negative environmental impacts. This, in turn, implies additional costs for national firms and the risk that the foreign investor might abandon the project if the proposing firm is a joint venture. CITMA is aware of the country’s need for foreign investment and the economic loss that may stem from a denial of the environmental license. Thus, in a few instances, CITMA officials have turned a blind eye to an environmentally unsound tourism development project. In this context, it can be argued that the Environmental License concession problem could be avoided if the EIA was carried out before the micro-localization, or even before the macro-localization process began and was subject to prior review. A second main criticism voiced against the changes occurring to the planning process since 1989, especially for urban areas, concerns power redistribution in the urban decision-making process and ineffective inter-institutional consultations for tourism investments approval. Indeed, tourism development is the outcome of planning interactions between MINTUR, State Holdings, DPPF, and a variety of state agencies ranging from the National Institute of Hydraulic Resources to the Center for Environmental Control and Inspection (Centro de Inspección y Control Ambiental, CICA), which are responsible for finalizing construction details and approvals. Although Figure 3 has exemplified the implementation of a tourism project as a linear process, the planning process is often untidy, non-linear and involves other components flanking the concession of the Environmental License. There are at least two other elements which are deemed essential to tourism planning. These are: (i) the Schemes of Tourism Territorial Development (Esquema de Ordenamiento Territorial de Turismo, EOTT) devised by the local DPPFs; and (ii) the consultation process that DPPFs1 initiate with other state agencies to grant micro– localization certificates. The EOTTs are framed within the wider context of a City Scheme of Territorial Development and aim at forecasting and guiding spatial transformations and land use related to tourism projects. They are updated every four years. For example, Havana’s EOTT was devised in 1997 and subsequently updated in 2001. DPPFs have also to consult a variety of State agencies to forecast the infrastructural needs of micro-localization projects and obtain environmental endorsement by CITMA. Informal conversation with a CICA specialist underlined that the consultation process typically lasts three days, which is often not sufficient time for an accurate technical study of the new tourist project requirements. As a result of this hasty inter-institutional consultation process, approvals for investment projects often do not forecast adequately the infrastructural and environmental demands that stem from such new projects. Further, in instances where projects have been deemed to yield a negative environmental impact, the National Assembly and the Communist Party have often constituted a higher-level mechanism that have overruled decisions made at technical levels. The growing importance of tourism in the Cuban economy has meant that the planning of this sector is crucial to minimize risks and create opportunities for environmental, social, and economic gains. Indeed, many Cuban authors and officials have already acknowledged the importance of an adequate tourism planning system for Cuba (Ledo, 1999; Pérez- Fernández and García-Zamora, 1999; Lanza, 1999). Tourism planning in Cuba presents at least four main peculiarities and structural elements that make it a unique process and difficult to fit within planning models and systems elaborated by authors and practitioners in the literature. The first peculiarity consists of a strong and growing Cuban military presence in tourism. Gaviota is a well-established company of the armed forces that gained experience in managing recreational centres for Soviet advisors back in the 1960s (Scarpaci et al, 2002). In Havana only, Gaviota today runs nearly 8 per cent of total hotel rooms. The presence of Gaviota in the Cuban capital increased in excess of fourfold in seven years, jumping from 203 rooms in 1996 to 946 in 2002 (OTH, 2003). Moreover, Gaviota now operates bus tours, marinas, a large fleet of taxis, and airline flights. The end of the Cold War era and involvement in many wars in Africa, have meant shrinking funds for military operations. The Cuban army therefore has increased its presence in the tourist industry hoping to achieve a certain degree of financial independence from the government budget and the rest of the economy. The army still represents an important interest group in Cuba and its plans for tourist development may not easily be included within the national and local planning processes. The second peculiarity stems from the monopolistic nature of the Cuban tourist sector, where all the firms involved in the offer of tourism products have been state-owned for the last thirty years and are now operating as State holdings. Such ownership may present administrative hurdles in terms of compliance with planning procedures and control mechanisms by the tourism industries and more generally by state holdings. 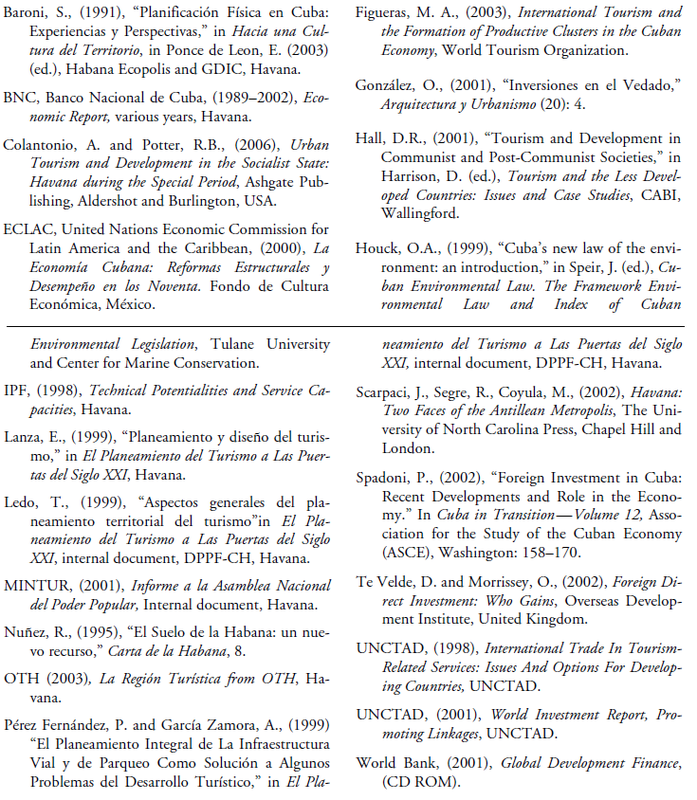 For example, Houck (1999) in discussing the effects of Cuba’s new Environmental Law, argues that government ownership of the totality of economic activities could pose problems for CITMA to bring state-owned enterprises into compliance with environmental requirements. On the one hand, in recent years CITMA has been empowered with tools and instruments to encourage good environmental performance and best practice by government industries. On the other, officials of CITMA are aware of the scarcity of financial resources that many firms are experiencing. They understand that closing down state economic activities will damage the national economy as a whole. The third structural element stems from the nature and operational model of joint ventures that can, at least theoretically, pose structural problem for the planning process of tourism. Indeed, joint venture firms act as a single company with a legal status which is different from the participating firms. Both participants put up a certain amount of capital or equity for the new company. However, Nuñez (1995) argues that the lack of financial resources has forced many Cuban firms to consider the use of land, especially in urban environments, as their main contribution to the joint venture. In his view, urban land has often been used as “simple input in the investment process” by the Cuban counterpart (Nuñez, 1995:3). However, the lack of any land market in Cuba makes it difficult for both Cuban and foreign firms to establish an appropriate valuation of the land, complicating the planning process. Moreover, foreign firms, while possessing better financial resources and technical facilities, normally contribute to the joint venture in terms of the design and the construction plan of the tourist development project. It may happen, therefore, that decisions affecting the type of project to be developed are taken at considerable distances from Cuba with the proponent being unaware of the local environmental and social conditions. 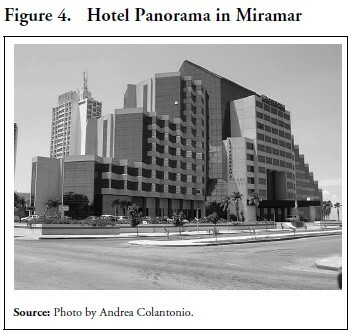 In Havana, for example, the construction of high-rise hotels in the 1990s, such as the Hotel Panorama LTI in Miramar, shown in Figure 4, has been criticized by some architects for clashing with the characteristic low-rise architecture of Havana and to a lesser extent that of Miramar. Hotels of this kind, which are not uncommon in Cuba, are built to meet the taste of many international visitors and often have glass facades. This architectural solution is not regarded as optimal since in the Caribbean there are many hours of sun per day. The glass absorbs solar heat more quickly than other materials and requires, therefore, a higher use of air conditioning systems. The last peculiarity of the Cuban planning system is embedded in the nature of the Cuban political system, which can offer the necessary continuity to achieve long term planning and management objectives. In many countries, the planning process is often embroiled in urban politics. Plans for development or environmental management, therefore, may last as long as the mandate of a municipal authority, that is, four or five years. From this perspective, the stability of Cuba’s central government may offer a potential advantage to guarantee the long-term political support to the planning process and to achieve pre-established objectives. This paper has examined the changes in planning practices that have emerged de facto in the 1990s and underlined the peculiarities and structural elements that make planning in Cuba a unique process. Further, it has highlighted several key features and planning issues concerning the future development of tourism in Cuba. Firstly, the current modalities according to which joint ventures between Cuban and foreign enterprises are set up risk to engender long term planning problems concerning land values in Cuba. Secondly, there has been a pragmatic shift toward short-term planning determined by the scarcity of financial resources of the 1990s. As a result, development plans are increasingly short-sighted and often driven by economic criteria. Thirdly, Cuban planning authorities have designed a formally well structured planning system that, however, at the practical level, does not allow for adequate institutional consultations and guarantee a sound environmental protection from potentially negative impacts of new tourism development projects. Future research should therefore investigate how Cuba’s current planning procedures can be modernized in order to pre-empt the negative outcomes of tourism- led development strategies which have characterized other Caribbean countries. Further, it should study how a fair and balanced division of tasks and responsibilities between Cuban and foreign firms can be implemented in the setting up of future international joint ventures. 1. DPPFs in Cuba also carry out (i) Study for the Feasibility of Urban Projects (Estudio de Factibilidad Urbanística) and (ii) Area Study (Estudio de Área) for land use concession. Both activities are of a consultative rather than strategic planning nature and require consultations with other state agencies, for example on infrastructural requirements and environmental authorizations before the final approval of development licenses.